“Two stars and a wish” might be a children’s activity but that surely doesn’t make it invalid for us who knows its worth. As a grown-up, you also have the choice of opening your envelope with 12 stars and 6 wishes at the same time as you open a bottle of wine. At CR, knowledge flow is central and there will be a separate post about this soon. But this is about a special type of flow – the feedback loop where you don’t communicate specific knowledge but rather how other people make you feel. As everybody else, we try to be good at giving and receiving feedback, and we are getting better at taking the time to ask for permission to get something off our chests that would otherwise keep us awake as it builds up. But most of the time, we still think we should wait for a better time… This year, our teenage year, we will invest in being better at this. We have a difficult job as it is, inventing on demand (within budget), and need each other more than we need frustration to build up. Positive comments keep coming though, but they are not often specific. “Good job!” “Great report!”. This can make you feel good, but how are you going to use it later? What was good? What should I try to remember to do also in the future? also from clients, the positive feed-back is heart warming but not always helping us getting better. Our company’s kickass-coach Philip Diab has helped us with the following magical question to ask clients, but also each other: “If there was one thing, one thing that we could do differently, what should it be and what would it do for you?”. It is a very simple question but it has already changed some of our internal ways in addition to how our quote process is performed for one of our major clients! “Two stars and a wish” is a peer feedback technique from school that we sometimes use at CR, and we did last Friday. Everybody got a note from each and one in the team with two appreciations and one suggestion for change. The fact that the appreciations are specific not only makes you feel good (how often do you get to read 12 notes on why people appreciate you?) but they also help you focus on your strengths. The fact that the suggestions come from your colleagues and are based on how they see that you could do better together, truly help you to think them through, to understand and try them rather than defend your old ways. “Two stars and a wish” might be a children’s activity but that surely doesn’t make it invalid for us who knows its worth. As a grown-up, you also have the choice of opening your envelope with 12 stars and 6 wishes at the same time as you open a bottle of wine. The result of our feedback activities will show up in more smoothly run projects, deliverables that hit the mark and an even more joyful feeling of doing our work not only with a purpose but also with joy and with people who want us to develop and make the best of our talents. It is not all happening over night, but it is happening. The good feeling is shared and Catharina felt so good about it she made us all some cake. Not wrap-up cake this time but “thank you for the feed-back cake”. 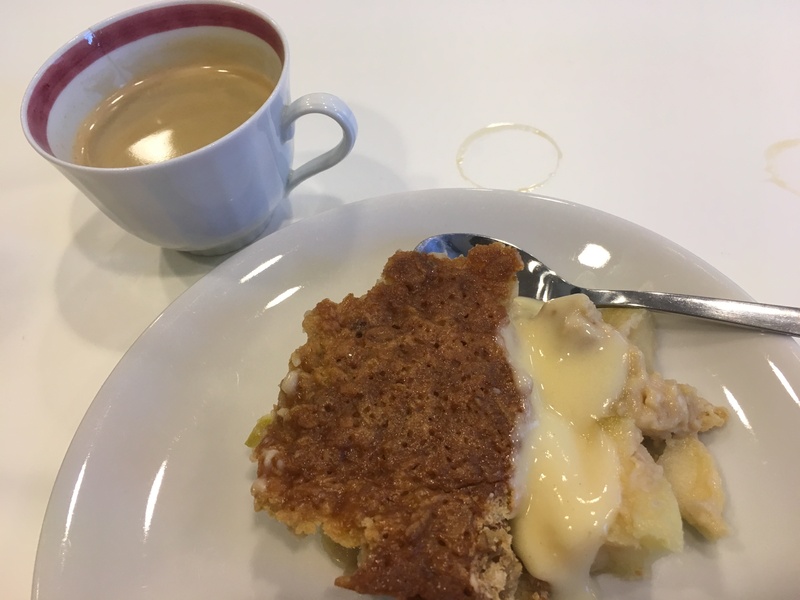 Apple crumble with custard. (and it wasn’t even on one of the wish-lists! ).